Start a new tradition with our vintage inspired full color tin recipe box. The classic design was made to last for generations and the metallic gold accents are the icing on the cake. 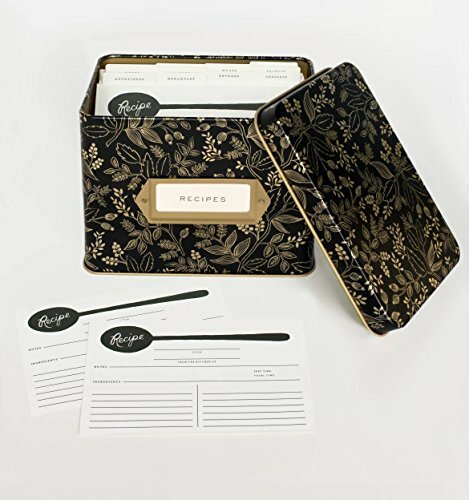 Includes 12 dividers and 24 recipe cards. Measures 6.25" x 4.25" x 4.5". Measures 6.25" x 4.25" x 4.5"
Brand: Plus Rifle Paper Co.
View More In Cookbook Stands & Recipe Holders. If you have any questions about this product by Plus Rifle Paper Co., contact us by completing and submitting the form below. If you are looking for a specif part number, please include it with your message.